When I was in college, he took me to an Indian buffet and I thought it (whatever it was that I ate) was delicious. But, I've never gone again. No real reason, except that I don't live near my parents...and, I don't know of an Indian buffet around where I do live. Nor have I ever attempted any "Indian" food at home. When I saw Kristen's Chicken Curry and Homemade Naan recipe, I thought, "I can do that! That looks easy...and yummy." So, I bought some curry powder and coconut milk...and YUM!! The flavor was fantastic! And, I was quite impressed with the naan! I didn't follow Kristen's directions for that - I made the dough in my bread machine...and don't have a griddle, so "grilled" up each piece in a nonstick skillet. If you've never had curry, this one is really simple (I also used leftover chicken instead of cubed boneless, skinless chicken breasts) and tasty! Be sure to stop over at Kristen's for the full recipe!!! I just finished reading Lauraine Snelling’s Red River of the North series. The six books follow the Bjorklunds, a Norwegian family who decide to make a new life in America. Brothers Roald and Carl Bjorklund, along with their wives and children, are the first to leave their homeland for this new country. Together, they struggle to build their dreams in what will eventually become North Dakota. After both brothers die during the winter months, wives Ingeborg and Kaaren struggle to keep the homestead alive and thriving. Each following book continues the stories of Ingeborg and Kaaren as well as other Bjorklunds who continue their trek to America. 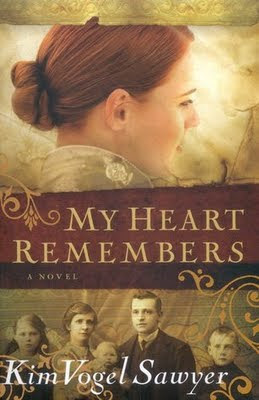 If you enjoyed Janette Oke’s Love Comes Softly series, I think you will enjoy the Red River of the North books. They aren’t really the same - I think Lauraine's books are a bit more serious, or show more of the reality and harshness of homesteading - but both are very similar in the prairie and community life aspect. As I began book 5, the story began slowing for me. I found myself anxious to begin another book, but wanted to finish the whole series. I plodded through the rest of book 5 and picked up book 6, expecting to skim/rush through it so I could start the next book waiting on my shelf. Well, I DID rush through book 6, but not because I was anxious to be done with the series. Book 6, Blessing in Disguise was the best of all the books! I LOVED it! One of the few remaining Bjorklunds in Norway, Augusta reluctantly agrees to come to America to help in her mother’s boardinghouse. Not believing the importance of learning English before she leaves, Augusta is confused and bewildered at her long trip west. Because of the language barrier, Augusta gets on the wrong train and ends up miles from where her family is expecting her. Instead, Augusta lands right into the arms of a young rancher, Kane, waiting at the station for his Norwegian mail-order bride. Kane doesn’t understand Norwegian…Augusta doesn’t understand English. What a mess. ;-) It was great! Although I'd read book 6 all by itself again, the entire series was very enjoyable. A bit more of a deeper read I thought than Janette Oke’s books, but enjoyable just the same. I am always amazed at stories of those who worked so hard to build their dreams in America. I don’t think too many today have that kind of work ethic and determination. I find weeding my garden a terribly difficult task! 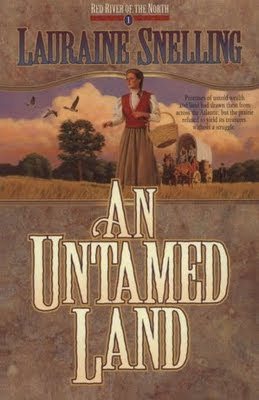 Lauraine Snelling also wrote three more books, Return to Red River, which I would like to read. I have already read the “Daughters of Blessing” series, which focuses on several of the children from Red River of the North. (As a side note): I am very excited that I have been recently accepted into another reviewer group. Even more exciting, one of the first books I'll be reviewing for them (in October) is Lauraine's newest book, A Measure of Mercy. At the end of this post, I didn't know I'd get to finally read more about Astrid! 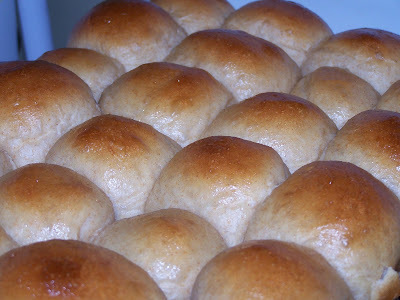 This is one of my all-time favorite roll recipes! The wheat isn't overpowering - just lends a nice subtle, nutty taste to the roll. They're soft and freeze well, too! When dough cycle has finished, turn dough out onto a lightly floured surface and cut into 24 pieces. Shape into rolls. Place on lightly greased cookie sheets; cover and let rise until doubled, about 1 hour. Meanwhile, preheat oven to 350 degrees F (175 degrees C). Lightly brush with an egg wash (1 egg, beaten with 1 Tbsp of water). Bake in preheated oven for 10 to 15 minutes or until golden brown. Kim Vogel Sawyer has got it. She can really write. Really. I just flew through My Heart Remembers, which is the story of three young siblings who are separated after being sent on an Orphan Train to Missouri. The oldest child, Maelle, promises her brother Mattie that she will come for him someday after already watching their baby sister Molly, along with the family Bible, disappear in the arms of a wealthy couple. Maelle, Mattie, and Molly all go their separate ways, each into very different lives. Will Maelle ever be able to find them again? Have they kept their “ties to home” so that she will recognize them? Kim absolutely knows how to capture the reader’s attention, imagination, and emotions. She is an amazing storyteller. I don’t have much more to say, except that I loved it. I’ll be filling my shelves with more of Kim’s books! Mmmm, I love warm cornbread alongside Spanish rice or chili. I especially love warm cornbread with butter and honey for breakfast. My husband loves leftover crumbled cornbread with milk and sugar. The recipe on the back of the cornmeal canister is good...but, I like a nice, sweet cornbread. Enter allrecipes.com! I just love that site! I tried a couple of different cornbread recipes. One had sour cream and creamed corn which was delicious!! But, those are not ingredients I always have around... so, I've only made it a few times. But, the Golden Sweet Cornbread recipe is exactly that! Golden and sweet! Just what I was looking for! I’m not sure exactly what I think about this book! 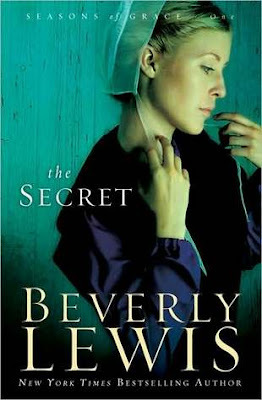 The Secret, Beverly Lewis’ newest book on the shelf, seems a bit different than most of her others. 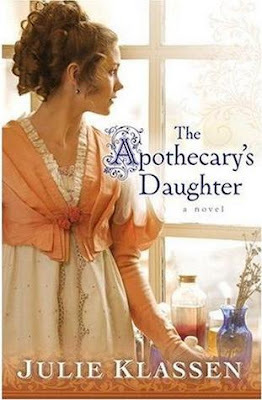 Some of Beverly’s books are written in a more contemporary setting, but because the characters are mostly Amish, it’s hard to tell what time period they are in. The occasional mention of a neighbor picking them up in a car, or the use of a phone, is about the only reference to the modern world. The Secret seems to have a dual main character – Grace Byler, a young Amishwoman and Heather Nelson, an Englischer. Because an Englischer seems to be an integral part of the story, the book is peppered with references to Twitter, iPods, email, and texting – not something that appeals to me when reading. However, that being said, Beverly still knows how to write a story that draws you in. I had to keep reading “just one more chapter” to find out the secret! Grace's Mamm is acting strange. No one understands what is wrong and Grace is becoming concerned. One day, Mamm just leaves. No one knows where she is; no one hears from her. Grace feels her Daed knows something, but won't reveal any secrets. Where could Mamm be?? What could be so awful in her life that she would leave her family so suddenly? Heather Nelson has just lost her mom to cancer. She herself has just been told that she now has the awful disease and must begin treatment. Heather refuses to admit something is wrong or go through treatments that only left her mom more sick and weak. Determined to find a more natural way and some peace, Heather arrives in Lancaster. By the end of the book, you will know the secret, but, if you’re like me, you’re going to feel like the whole secret wasn’t told! I have my suspicions, but I have to wait until book 2 is released! The Missing won’t be available until September. Not too much longer to wait! If you enjoy Beverly’s books, I don’t think you’ll be disappointed in The Secret. I just generally prefer books pre-WWII, so the setting was the only thing I didn’t really like. Even though I know The Missing will very likely be filled with more modern references, because of the characters, I am still anxious to see the rest of the secret revealed!